I am amazed that Paul hasn't posted about this one yet. Someof us are getting these printers as, for the price, I don't think they can be beat outside of sourcing your own parts. 300 x300 mm build area for $499 base price, $50 coupon available as of now. Mine was order right after Ben... $449 plus upgrades for that size?!? I just couldn't pass on it. I had been specing out a custom build and it was going to cost over that. BLTouch is going to be ordered here soon. I am going to order metal brackets here as well. Titan... I might wait and see how the stock one works, don't know. I will upgrade to the Titan at some point, unless they come out with a newer one. Probably will get the 713 gantry and hotend carriage upgrade at some point too. The only printers that can do this size are the Raise3D N2 Plus ($3299) and the gCreate gMax 1.5XT ($2995) The Raise3D has a full enclosure but no part cooling fan control from what I can see. It doesn't auto calibrate as you would expect for something with that sort of price. The gCreate seems to edge the Raise out from all the reading i have done on it. But those prices are 7 times more than the FT-5. After you spend $150 or so for E3d items and BL touch, you have a very impressive printer. I made and extended version of the FT5, with 40X30X55cm build space, for a special project. I am still waiting for my Keenovo heated bed, and Vulcano extruder, and will change to 24V system. it is a great printer to expand and tinker with. My only concerns are the wiring....and the calibration. Any tips you can offer? but I just blindly followed the wiring diagram on the site. the biggest problem is not making good connection with the wires on the board, that could result in a sparks and melting parts. Construction wise, is to get the frame as square as possible and the sliders for the axis correctly adjusted. tighten one y-slider, move the axis to one end, tighten the opposite side, and redo for the other end. with the z-bed it is important to lower it to the bottom, tighten one side, the the other side, move it to the top and repeat. and test the movement before attaching the belts, all axis should move very easy by hand. I really recommend using alu brackets to build the frame, it makes it so much sturdier, the melanine will always be a little flexible. I now have received my E3D set, and am working on a new fan shroud, the ones on Thingiverse look like they have too small exit holes, or with just 1 fan attached. it will be the same but have a fan shroud on both sides. 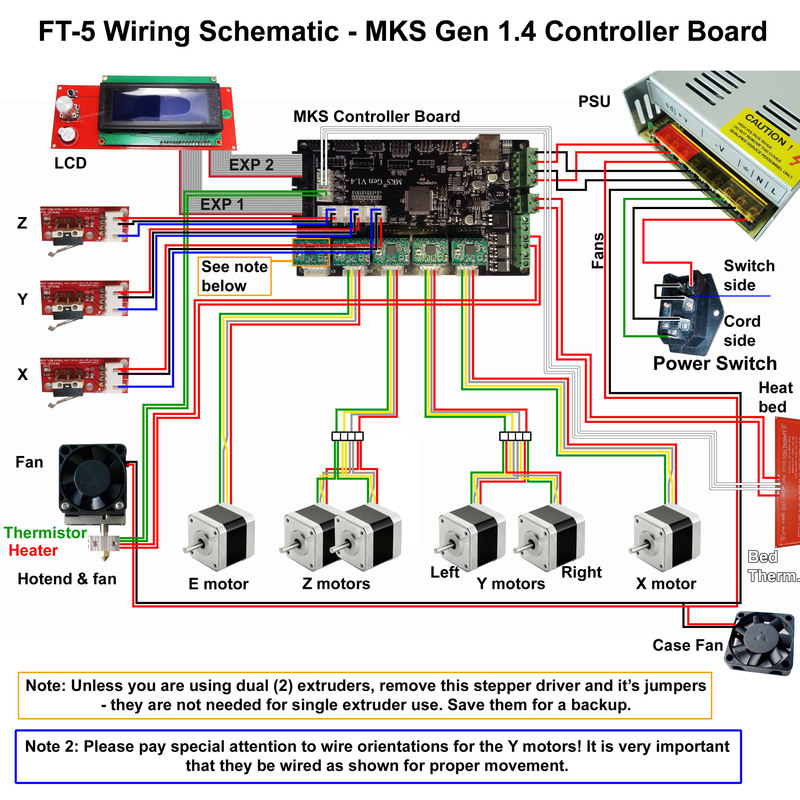 or you might consider making a separate fan controller, to control during printing. Something I want to add, is a filament sensor, with making huge prints you might run into an empty spool sooner, and having a sensor that pauses the print would be a nice touch. Got the Titan extruder and the Vulcano nozzle done, and happy to be able to use all my 2.85 rolls. I must say the online tutorials are not really clear, I got trouble as the grub screw that clamps the toothed sprocket on the stepper axle was sticking out too much, and I had to file it down half way to get it to work, and had to add about 2mm between the titan and the stepper to get the toothed sprockets to sit flush with each other. It could be, using the FT5 standard stepper is maybe not often done, and the E3D stepper is different. After some test prints I found that too much fan air causes thermal runaway, this is something I will have to account for when designing the fan holders, and is a nice safety feature. After fiddling with the print head, the melanine parts are showing signs deformation, the printhead is sitting very slightly angled, I can see it with flat surfaces, it leaves small marks. and the 713 parts will probably be the next on my wish list, or make it myself. Do you think it's worthwhile to get the e3d stepper? I read that the E3D stepper has less torque, and is mostly used to minimize weight the of the print head. the standard stepper does work without problem, and I did not want to add unnecessary cost. This does it make a bit more difficult to find silent fans, but the E3D fan on the hotend, although small, makes a lot of noise. I first stared with making a copy of the FT5 parts, but realized that it is not necessary, it can be much simpler because it's aluminum. Are you running a stepper or a pancake on the extruder?